-- Hayden (Abby Ross) in "Ladies Drink Free"
This week's episode of The CW's Supernatural began in the same way that countless horror movies (and episodes of this show) have, with two teenagers taking a late night shortcut home through the darkened forest. One is a spoiled teenage girl, caught sneaking into a bar and texting with an unseen boyfriend, the other is her concerned brother (Jordan Burtchett), who ends up getting attacked and killed by a snarling, mask-wearing man. What would have been more surprising if it wasn't for the episode's title is that this strange creature only bites the girl before running away. Naturally, the Winchesters visit her at the hospital in order to ask questions, but this time, they have a special guest. So how many of us think that Mick Davies (Adam Fergus) is going to be a series regular at some point? There doesn't seem to be much of a consensus among Supernatural fans about his character yet, possibly because the show has mostly left him as a blank slate in order to keep the character mysterious. But perhaps more so than in any other episode, we learned more about him here. Dean still doesn't trust him or the British Men of Letters (BMoL), and makes his feelings obvious by referring to Mick as “Harry Potter” and refusing to admit that the three-star hotel he picked is the best he's ever seen. As to be expected, Sam (Jared Padalecki) is more open-minded, relishing the chance to read through old BMoL logbooks and listen to their official podcasts. (How secret can organization be if it has its own podcasts?) Sam is especially intrigued by the concept of a “hunters' college”, where Mick was formerly educated on monster lore. One can easily imagine that a possible death-free ending for the show (or the beginning of a potential spin-off) would feature Sam as a professor at that place. Still, the Winchesters are kind of stupid when they trust Mick, as they believe a werewolf is responsible for the attack, and he claims that the girl doesn't have any bite marks on her before he awkwardly excuses himself and leaves. The BMoL have taught him that werewolves are irredeemable and unable to live harmlessly in polite society (as the Winchesters' friend, Garth (DJ Qualls), had proven in a previous episode), so he sneaks into the hospital to give the girl a lethal injection before the full moon causes her to transform and scratch Mick. The show wants us to feel bad for her, and hate his methods, but would it have been better to have a wild werewolf running around in a hospital? Mick is therefore shown to be frequently shifty and dishonest, but nervous enough about it to be considered “a bad liar” by Dean. By the end of the episode, he seems to show genuine empathy and remorse for what has happened, so perhaps he will turn out to be a “good guy” after all. It's very likely that by the time the finalé rolls around, we'll see a epic showdown between Mr. Ketch and the BMOL supervisors verses Mick Davies and various other members of the organization. Upon questioning two bartenders at the local bar (Matt Visser and Ryan McDonell), the Winchesters discover that Claire (Kathryn Love Newton), the teenage daughter of Castiel's human vessel (Misha Collins), has been trying to investigate the case unbeknownst to her legal guardian, Sheriff Jody Mills (Kim Rhodes). Naturally, they tell her she has no business being there, and she continues her “rebellious teen” shtick by donning colorful headphones as she storms off to the sound of The Pretty Reckless' “You Make Me Wanna Die”. Once she's out of sight, she gets attacked and bitten by the masked werewolf. You would think that Castiel would sense this with his angel-powers and at least appear in this episode, but that doesn't happen. Instead, Sam remembers the details of a rejected cure for lycanthropy in one of the old logbooks, and Mick, in an effort to redeem himself, offers to watch over Claire as the brothers try to procure a necessary ingredient: the blood of the masked werewolf who turned her. They believe one bartender is the werewolf, but they have guessed wrong. So it's up to Mick to save Claire, as she's kidnapped by the lone (emphasis on alone) alpha werewolf, the other bartender at the bar who was the first victim's secret boyfriend. Apparently, the BMoL have killed off the rest of his pack, forcing him to try to create a new one for himself. In the resulting scuffle, Mick kills him and makes the potential cure. Supernatural does it's now-frequent trick of making us wonder if she's going to live for a split second before showing us that she's cured. As Claire drives off to the sound of Joan Jett & The Blackhearts' “Wild One”, apparently learning nothing from this whole experience, the Winchesters resign to give Mick another chance. 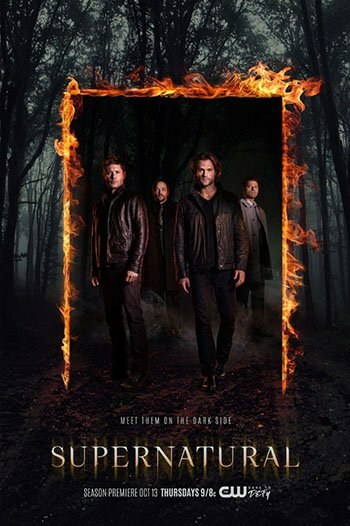 Supernatural was off of the air for two weeks (blame March Madness), and fans of the show were probably expecting something a little more substantial than this. The show has never really seemed to grasp the werewolf concept well, with some of the series' weakest episodes often featuring their mostly hairless, scratch-safe versions of the monster classic, leaving this episode a rather predictable mish-mash of previously explored monster-of-the-week territory. The various moments of humor are enjoyable and the main plot can hold one's interest, but “Ladies Drink Free” still leaves viewers wondering just how the series is going to tie its major loose ends in the relatively short amount of time left of the season. The CW has finally gone back to the practice of showing a Supernatural preview after the end of each week's episode, and from this we saw that Mick will be on another adventure with the Winchesters next week, the angels are still chasing Kelly, and Mary is sleeping with someone. (Does this mean that Dean and Sam are going to get a baby brother or sister?) Stranger things have happened.